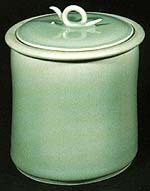 Brother Thomas Bezanson (August 5, 1929 – August 16, 2007) was a Canadian born artist and Benedictine monk primarily known for his porcelain pottery and mastery of complex glazes. Strongly influenced by Asian pottery, often adapting traditional Chinese and Japanese pottery methods and materials to his work. Brother Thomas was born in Halifax, Nova Scotia, a descendant of Irish and Scottish families that had been in Nova Scotia for many generations. In 1950 he graduated from Nova Scotia College of Art and Design. He also spent some time in New York City studying at Art Students League of New York. From 1951–58 he both worked in business and was an advisor to the Nova Scotia Handcraft Century. He began working in pottery in 1953. In 1958–59 he traveled and studied in Europe. In 1959 he entered the Benedictine Monastery, Weston Priory, in Weston, VT. In 1968 he graduated from University of Ottawa with a master's degree in Philosophy and a University Gold Medal. In 1976 he was a visiting lecturer at Alfred University School of Ceramics. In 1978 he traveled in Japan and to Taipei. While in Japan he met with five "Living National Treasure (Japan)" potters. In 1983 he was awarded a National Endowment for the Arts grant. Since 1985 he has been the Artist-in-Residence, Mount Saint Benedict, Erie, PA. He has had hundreds of exhibitions in galleries and museums around the world. His works are in over 80 museum collections. Brother Thomas is renowned for his original glaze recipes and perfect forms and always sought to create something new and beautiful. His exacting standards made for the shattering of over 80% of each firing. One "rescued" piece, however, is now in the collection of the Museum of Fine Arts, Boston. Brother Thomas died at his home in Erie, PA on 16 August 2007. It was Brother Thomas' dream and vision to establish a Fund to help struggling artists, as he was helped in his life's journey. The Brother Thomas Fund was established under the auspices of the Boston Foundation upon the artist's death. Since 2007, proceeds from the sale of his work have gone into this Fund and in October 2009, the first eight Brother Thomas Fellowships were awarded to struggling, mid-career Boston artists in the amount of $15,000 each. Exhibition Catalogue. 79 pp., illus. (some col. ); 23 cm. Exhibition held at the George Walter Vincent Smith Art Museum, Springfield, Massachusetts, June 1-September 7, 1980. "Art is meant to open the human heart to truth and beauty, goodness and unity. It is like a finger pointing to the moon. It is not the finger that is important, it is the moon." "First you do what is necessary, then you do what is possible and before you know it you are doing the impossible." "The thing we all strive for is to shape our humanity in the image of God, to do good, stand up for what is true, create what is beautiful, and live for what unites and does not divide." This page was last edited on 22 December 2018, at 21:15 (UTC).